In many ways Agatha Christie paved the modern day landscape for the murder mystery: an expert in employing the Red Herring, Christie is known for her writing which most undoubtedly keeps the audience/reader guessing until the very end. It is with reason, then, that any fan inevitably looks forward to the reveal; the unique plot twist which tells all. In this manner, The Unexpected Guest lives up to expectations–even if the race to the finish ends up more a saunter. Set in South Wales in the 1950’s, The Unexpected Guest (first produced in London in 1958) is a mystery surrounding the events that led up to the death of Richard Warwick, patriarch to the Warwick fortune. 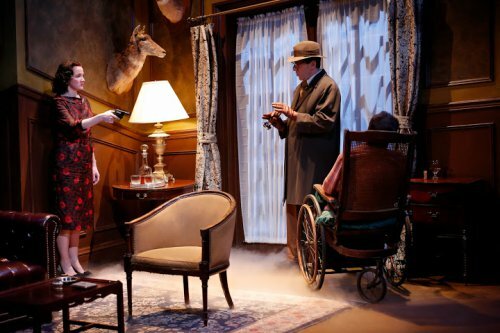 In the opening minutes of the play, his lifeless corpse is discovered by Michael Starkwedder (Nicholas Viselli), a seemingly random stranger who—upon driving his car into a ditch—stumbled up to the Warwick Estate in search of assistance. Upon discovering the body, Michael is confronted by Laura Warwick (Pamela Sabaugh), now widow to Richard. Almost immediately, Laura admits that she murdered her husband. Michael, sympathetic to Laura’s predicament, can’t be convinced that she committed the crime and instead decides to help her come up with a sound alibi. Together, the two come up with a plan to blame the murder on the most well-known enemy of the deceased: a man called McGregor, whom they believe would have had reason to seek revenge against Richard in the event they ever met again. This is the setup that the entire play hinges upon. The only actors on stage for the first half hour are Viselli and Sabaugh, and they do an excellent job of “framing” the story. Viselli’s Starkwedder, addressed on occasion as the Unexpected Guest—Dame Agatha at her pun-intended best—is in many ways the through line in the rotating cast of characters. With neither a thing to gain or lose regarding the Warwick Estate, Viselli’s strength lies in that his polished performance makes room for the more archetypal members of the Warwick Clan. As the other family members are introduced, it is increasingly clear that this is no normal family. Christie paints a family portrait shrouded in darkness, and one could make the case that there was something for every single member of the family to gain in Richard’s passing. The Unexpected Guest is an ensemble driven piece. Directed by Victoria Rauch-Lichterman, this is a play filled with strong and nuanced performances across the board. The play was designed so that not one single character shines too brightly amongst the others, and Rauch-Lichterman manages this aspect of the production very well. Richard’s half-brother Jan is one of the best written roles in the show, played with deep emotion and conviction by Christopher Imbrosciano. Easily manipulated, Jan is a misguided disabled boy who is constantly used by his dysfunctional family. This dynamic leads to some of the most powerful storytelling of the evening. Considering that the play takes place in only one location, Richard Warwick’s study, the production value is hit or miss. Set and light designer Bert Scott does a wonderful job of transporting the audience to South Wales for the evening most particularly with his lighting design. Unfortunately the set has some flaws, including a bland backdrop that—if nothing else—lacks in detail. There were also multiple occasions where movement/sound could be heard from the wings at the performance under review. Amanda Jenks’s costume design for the production is a major achievement. The pleated pants with tweed jackets, high waist skirts with liners, and thick ties with widespread collared dress shirts aid in a subtle yet clear throwback to the English style of the 1950’s. In the end, the only complaint to be had with The Unexpected Guest is that the storytelling is too linear. Moment to moment, Christie plants the idea in the audience’s mind whom they should think the murderer is, and then in a timely fashion debunks the theory before cleanly moving on to the next suspect. 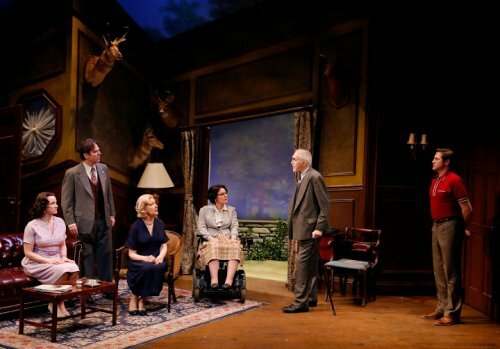 Leaving that aside, this is not to say that the play is without its moments: the lead-in may be straightforward, but the payoff to a conclusion which is equal parts surprising and sentimental is well worth the wait. Ordinary people in a small-town Irish pub tell ghost stories to each other in this beguiling and atmospheric play that is superbly acted.